And so, at long last, the 2009 Oscar season comes to a close. I won't say I am sorry to see it go. It was a long, grueling season, filled with an unusual amount of nastiness and underhanded campaign tactics. 2009 has worn out its welcome, and I am more than happy to move on. 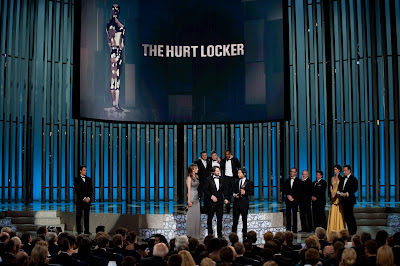 Kathryn Bigelow, Mark Boal, and Greg Shapiro accept the Academy Award for Best Motion Picture of 2009 for the film "The Hurt Locker" during the 82nd Annual Academy Awards at the Kodak Theatre in Hollywood, CA, on Sunday, March 7, 2010. Photo by Michael Yada / ©A.M.P.A.S. It's no secret I was mostly ambivalent about this year's Oscars. I didn't really have a strong horse in the race. My favorite was A Serious Man, but I knew it stood no chance of winning. The only things I felt passionate about were The White Ribbon winning Best Foreign Language Film (it didn't), Gabourey Sidibe winning Best Actress (she didn't), and Kathryn Bigelow winning Best Director (she did). Yes, I thought Avatar was a better film than The Hurt Locker. But it was nearly impossible to root against Bigelow. And her winning was one of the truly inspiring moments of the night, and I will freely admit to tearing up. The gravity of it was undeniable. I was afraid that the show's producer, Adam Shankman, was going to turn the ceremony into a gaudy reality show wannabe. But much to my relief, he didn't. I did think there was too much drama rousing in the announcer's commentary ("Will Kathryn Bigelow become the first woman to win Best Director? Or will Lee Daniels become the first African American? Will it be The Hurt Locker or Avatar for Best Picture, or will there be an upset? "), things like front runners and upsets shouldn't really be acknowledged during the ceremony. Those of us who follow the race know the stakes, there's really no need to push too hard for dramatic tension and lessen the dignity of the event. We've been splitting hairs about who will win for months, for one night, just let them all be on a level playing field. The biggest issue about the show, for me, was the inexplicable inclusion of a break dance ballet set to selections from the Best Original Score nominees. It may have been one of the most bizarrely awful things I have ever seen at the Academy Awards. It was awkward, inappropriate, and out of place, completely distracting from the fact that we're honoring the SCORES, so why are there people out there doing a break dance interpretation of The Hurt Locker? It was embarrassing on all counts. Dancers perform from the Academy Award nominated Best Original Scores during the 82nd Annual Academy Awards at the Kodak Theatre in Hollywood, CA on Sunday, March 7, 2010. Photo by Michael Yada / ©A.M.P.A.S. The only thing about the actual winners that really annoyed me was Argentina's El Secreto de sus Ojos winning Best Foreign Language Film over Germany's The White Ribbon. I was expecting A Prophet to take it, but El Secreto was the one film among the five that I actively disliked (The Milk of Sorrow is just bizarre). It doesn't really surprise me that they awarded the weakest film of the bunch (the Academy's track record in this category is abysmal), but it still stung. El Secreto is a bland soap opera dressed up to look like a police procedural. The White Ribbon is something deeply masterful. It was the best film nominated for any award at the Oscars tonight. While I knew that Sandra Bullock was all but guaranteed a win for Best Actress, I had really begun to work up hope for a Gabby Sidibe upset. It was hard for me to begrudge Bullock her win though, after her beautiful and classy speech, but the award really belonged to Sidibe. Bullock is well liked and has been around for a long time, but Sidibe is the one who really reached down deep and pulled out something extraordinary. It will be a performance that will be remembered and talked about long after The Blind Side has become a footnote in Oscar history. But that is all in the past now, thankfully. I was burnt out with 2009 before the year even ended. The ceremony had its high points (Kathryn Bigelow, the sadly underused host duo of Steve Martin and Alec Baldwin), and low points (the Original Score dance numbers, the bizarre Best Documentary Short "Kanye West moment"), but the most important part is that the show as a whole was not the epic disaster I feared it would be. Not the worst I've ever seen (hello 2004! ), but not the best either. 2009 is officially over. Now bring on 2010! I'm with you - 2009 didn't have too much celebrate, evident by the dullness of last night. Here's hoping for some freshness in the new movie year! Yeah I agree. Not the best, but hardly the worst either. I still say new producers next year though. Yeah, Shankman's sensibilities just aren't right for this. I don't like his emphasis on the competitive aspect of the awards. Leave that to the blogs. The Oscars should be more of a celebration of the films rather than competing with each other. They're just doing the best work they can, not trying to outdo everyone else.